If you’ve logged onto your Facebook business page lately, you’ll notice that your notifications look a bit different (or if you haven’t yet, you will soon!). It was sort of a blow-by-blow account of what was happening on you page in terms of likes and comments. I liked this system. It told me, at a glance, what was happening. Facebook has changed this. Of course. It’s a breakdown of all of my posts, and it gives me an overall look at how each post is doing, but it doesn’t tell me anything about likes or shares or comments. Why did Facebook do this? No doubt a blatant money grab. You’ll notice beside each post, I’m given the opportunity to “boost” the post. This is Facebook’s new “promoted post” feature, which allows me to give them a few extra bucks (starts around $5-6) to have my post be seen by more people than it can currently organically reach. But now, in order for me to see what’s happening on my page (which is really important for me to know so I can respond), I have to click on the “Notifications” button on the very top of my page. That takes me to a page that lists my notifications, similar to before. Except now, I have to do another, additional click to get there. See why I dislike? Okay. So. Here are a couple of options to make your life easier in the wake of this new update. In order to do this, when you’re in your main Facebook stream (click on “home”), you’ll see, further down in your left-hand main menu, “Pages.” Underneath that will be the pages you administrate. Hover your mouse just to the left of the one you want to add to your “favorites” menu, and a little pencil icon will appear. 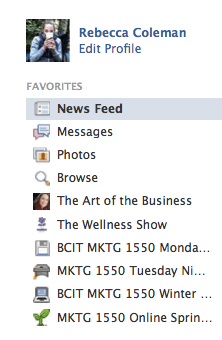 Click it, and then “add to favorites.” It’ll move your page (and it’s notifications) up to the top of your menu. 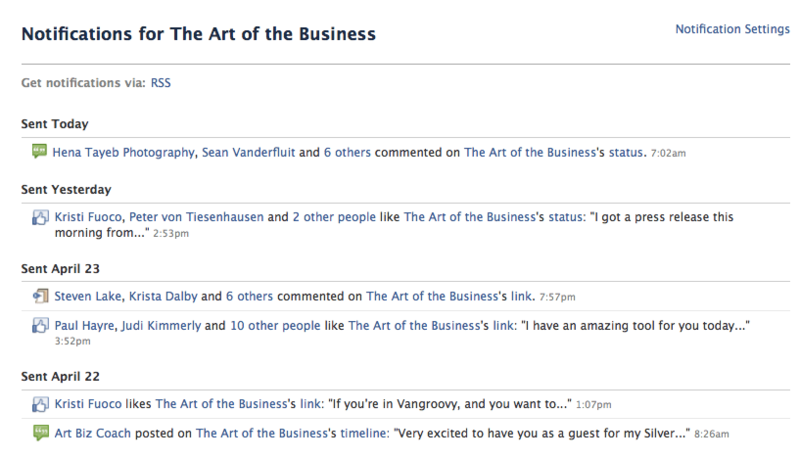 Secondly, add your page’s notifications to your regular notifications. In your normal FB life, if someone comments on something or likes something or tags you, you get a notification on the little icon that looks like a world in your upper navigation bar. You can add your page’s notifications to these by going to your page, and clicking on “Edit page”–>”Edit Settings.” In the main, left-hand navigation menu, click on “Your Settings.” Check the very bottom box “Onsite Notification.” And voila! Until the next time Facebook messes with our pages…. (which will probably be tomorrow). Lately I’ve been finding a “buggy-ness” when I try to share a link with a status update. Sometimes the image with the link is available as a thumbnail option, sometimes it isn’t. Sometimes I get the “Meta – Page Title” as the “headline”, other times it’s the wieldy URL. Yesterday, I had to plug in a captcha in order to post something. There seems to be no rhyme or reason to any of it. For all their effort to encourage me to do it, I have no interest in paying to promote a post when it doesn’t appear the way I want it to appear. FB is buggy A LOT! And yes, yesterday I was posting up some links, and had to do captcha three times in a row! Not impressed.